2. the need for the two municipal history organizations, APHNYS and GAHNY, to collaborate more effectively. One telling issue for municipal historians in the state, to be addressed below, is the challenge is simply maintaining a database of the municipal historians in the state. For that matter, even tracking the number of municipalities can be difficult as new ones are created. It’s hard to imagine that the relevant organizations don’t know who the clerks are …or the mayors! Since the conference was called by the State Historian, I will defer to him to report on the presentations. In this post, I will present my thoughts on what needs to be done. To some extent, these items will repeat things previously reported on and some came about as I was thinking in response to the presentations at the conference. All suggestions should be considered part of the process of creating an agenda for a New York History Alliance that also was the subject of a previous post and will be of a subsequent post. I will not draw too fine a line between county historians and local historians nor between county historians and county historical societies. We are all in this together. The term county will be used to refer to boroughs as well. Similarly county executive also includes borough president and county legislative chair as appropriate. 1. All counties should have a human being as county historian. 2. In counties with populations in excess of 100,000, the county historian should be a full-time position. 3. In counties with a population between 50,000 to 99,999, the county historian should be a part-time position. This position could be combined with another position such as archivist, librarian, or records manager. 4. New York City, a city consisting of five boroughs, should have a city historian. 5. Each Community Board in New York City should be considered a municipality and have a municipal historian. At the conclusion of the training, there should be a ceremony at the Executive Mansion with the distribution of certificates by the Governor (with appropriate photo-ops) to signify the importance of the position. 1. The county historian whether full-time or part-time on the payroll or with a stipend should be treated as department heads and/or public county positions are in the county. This means the county historian should be on the county website with a county email address, telephone number, mailing address, business card, and work space including for the storage of artifacts if owned by the county. 2. The county historian should maintain a list of all municipalities and municipal historians in the county with an option to include all history organizations on the county website. a. the county historian should report changes in municipal historians to the organization or individual responsible for maintaining the statewide database of municipal historians. b. the county historian should prepare an annual list for the county executive to certify to the Deputy Commissioner for the Office of Cultural Education that the county is in compliance with the requirement for all municipalities in its jurisdiction to have municipal historians. The following list is not meant to be exhaustive but instead to focus on some things which aren’t necessarily being done. 1. The county historian should meet periodically (at least quarterly) with the municipal historians. Such meetups mean physically, in person, and can include brown bag lunches, after-hours behind the scene tours, tavern socials, etc. The location should be geographically rotated as appropriate. 2. County historians should be members of one of the two private municipal historian organizations and attend the state and/or regional conferences. 3. County historians should communicate with the municipal historians on a regular (monthly) basis in a newsletter which preferably would be electronic. Municipal historians and history organizations should be encouraged to contribute to the newsletter to share what they are doing. 4. There should be an annual county history conference. 5. There should be an annual high school local history conference. Given the range of the number of public and private high schools in a given county, it may be necessary to subdivide the county or have a multiple-days conference. 6. The county historian should create a county history course for teachers and as adult education class possibly in conjunction with a local SUNY, CUNY, or private college. The teacher course should comply with professional development and CTLE requirements. The class also should include field trips to the history sites in the county. 7. The county historian should work with the county TPAs to develop tourist programs in the county and in conjunction with neighboring counties as history does not necessarily follow current political boundaries. 8. The county historian should appear annually before the County Legislature to report on the activities of the previous year. 1. End the need for everyone to reinvent the wheel – Technology changes rapidly and it is unreasonable to expect all 62 county historians plus the hundreds of municipal historians (and history organizations) to keep up. The state should take a leadership position in partnership with APHNYS, GAHNY, and MANY in monitoring technological change, identifying vendors and/or applications, and in creating templates for statewide use. Two immediate areas to be addressed are a template for an enewsletter county historians can send monthly and a county history website. What type of information should county historians include on their own county website and in what suggested standardized format? 2. There should be a New York State History podcast. 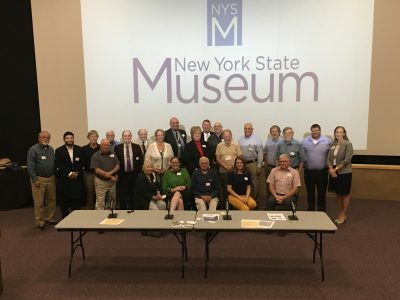 The podcast would not consist solely of scholars who have written or are writing about New York State history but would include the entire history community. Discussions could include conference organizers, museum exhibitors, teachers, anniversary celebrations, etc. 3. There should be an REDC bucket through the New York State Museum for history-related projects just as various other state organizations disperse funds annually. The above items are my suggestions and not necessarily those of anybody else. One immediate goal then should be start a discussion based on the wish lists of others to see if there is some consensus or overlap. Assuming that the history community is capable of actually having such a discussion and then agreeing on our “asks” and the priority, we would then need to determine exactly who needs to be asked: the Regents, the Governor, the state legislators, the county executive, the county legislators. Another consideration is the process by which the history community will “ask.” As previously reported, Massachusetts is creating a state history alliance to achieve this goal; New York should do the same. One final comment. November is New York State History month. All the state and county legislators will be home then. There may be some changes after Election Day at the county level depending on your county. So how about after Election Day and before Thanksgiving, the members of the history community request meetings in their own county with their state legislators, county legislators, and county executive to discuss your history agenda. It probably is easier to start with someone you might know and who lives in your own community before trying to lobby in Albany in the 2018 session. Thanks for this, Peter. I face a similar dilemma/opportunity with the nominal historians of each of MLB’s 30 clubs. A handful of clubs employ full-time historian-archivists, while others place the archives in the hands of public-relations folks with little extra time on their hands. This was a breath of fresh air to read. Excellent suggestions. I’m sorry to bother you with what is probably a stupid question, but I’ve been a municipal historian for 32 years and I don’t know what GAHNY is and couldn’t seem to find out what it is on the computer. I know of APHNYS as I was a member for a number of years but quit because of some of their policies. Could you tell me what GAHNY is so I could go to their web site? When I put in GAHNY I don’t seem to get anything useful. It is interesting to note that people from this organization did not notice the missing “W” in the posting by the state historian which I copied. ironically, he will be a speaker at the upcoming conference. Jack was at the meeting although it may be hard to see him in the photograph. The recommendations in the post relate to deficiencies in the municipal historian regulations such as why New York City doesn’t have a historian or why community districts don’t even though they are larger than many towns and villages which do. Are you asking who are our city and borough historians? Ron had planned to attend but was unable to. Mike was at the meeting although it may be hard to see him in the photograph. He is the Borough of Manhattan historian, there is no New York City historian. The recommendations in the post relate to this deficiency and others in the municipal historian regulations. To answer the question in the subject line, “Who is the Borough of Brooklyn Historian,” I am. Ron Schweiger. I have been in this position since February, 2002, when Brooklyn Borough President, Marty Markowitz appointed me. The current Borough President, Eric Adams has kept me at that position. The five Borough Presidents of NYC try to get together on a rotating basis every 4 or 5 months. Our individual schedules vary which makes it a bit difficult to set a definite date in advance. Just a little background: I was a science teacher for 39 years. From 1970-2001, I taught science at P.S. 219, an elementary school in the East Flatbush neighborhood of Brooklyn. From 2001-2009, I was a science teacher at the Yeshivah Of Flatbush, Brooklyn. I began studying Brooklyn history strictly for my own interest in the 1970’s. I began collecting books, maps, photos, postcards, and other related materials on Brooklyn’s rich history. One third of my basement is Brooklyn Dodgers memorabilia!! I began presenting lectures and conducting walking tours in some of Brooklyn’s historic communities. Often, I am asked by the media (TV, radio, newspapers, internet, etc. ), for information regarding some aspect of Brooklyn history. I have contributed to several books on that subject. In 2007, I was in the 2 hour, HBO documentary, “The Brooklyn Dodgers, The Ghosts of Flatbush.” I have been on CNN, NBC Nightly News, and most of the NYC network news channels. I am past President, of the Brooklyn College Alumni Association (2009-2013 (CUNY). I teach a class at Brooklyn College on Brooklyn History. It is in the Brooklyn Lifelong Learning program for retirees. I am past President of my synagogue, Temple Beth Emeth v’Ohr Progressive Shaari Zedek of Flatbush from 2004-2009. It is a congregation founded in 1911. We are about to begin our 107th year. Sorry you couldn’t make the meeting in Albany which was the subject of the post. Still, all in all, to have three borough historians attend is pretty good. Yes, I know you are the borough historian. The trick question was on the NYC historian since there isn’t one. As I mention in the post for recommended actions, there is a gap in the municipal historian regulations when a borough of millions can have one historian while counties with under 500,000 people in total can have dozens. That’s why I added the part about Community Districts which should be considered like towns and villages. Creating an advocacy agenda will be an uphill battle. Brooklyn Borough Historian is Ron Schweiger!! Who cares about The Other Borough? Boroughs..
and Ron is past president of the Society of Old Brooklynites. He was wonderful. Is wonderful. He has been Brooklyn Borough Historian since 2001 I think, under Marty Markowitz and under Eric Adams. Before him was John Manbeck, probably Borough Pres for a million years under Howard Golden. I recognize 2 members from of our Bronx county historical society in the photograph….good to know. I also note of 22 members, only 6 are women……is there any way to remedy that in your opinion? I would think that has some affect on determining what/who gets considered historically important by the group. I am still wondering about the history map of important NY women that I had read about, but can’t find any info on its progress, or how to add suggestions…….do you have any info on this???? I would not read too much into the photo. At the municipal level there are many female historians and most of the full-time paid county historians are female. Most county historian jobs either don’t exist or are volunteer with perhaps a small stipend for some expenses. I am not familiar with the history map you mention. Who is responsible for it? Where did you read about it?